Bessie Stringfield is published by Fulcrum Publishing and distributed by IPG. Imagine a five-foot-two-inch-tall woman riding a Harley eight times across the continental United States. Now imagine she is black and is journeying across the country in the pre-Civil Rights era of the 1930s and '40s. 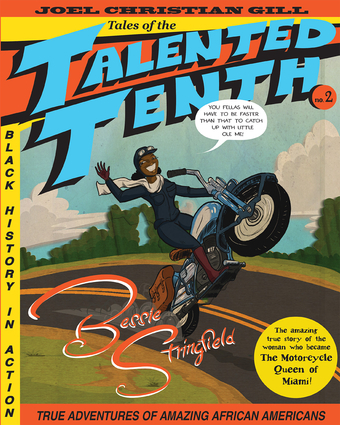 That is the amazing true story of Bessie Stringfield, the woman known today as The Motorcycle Queen of Miami and the first black woman to be inducted into the American Motorcyclist Association Hall of Fame and the Harley Davidson Hall of Fame. Stringfield was a pioneer in motorcycling during her lifetime; she rode as a civilian courier for the US military and founded the Iron Horse Motorcycle Club in Miami, all while confronting and overcoming Jim Crow in every ride. Joel Christian Gill is the Chair of Foundations at the New Hampshire Institute of Art and recipient of the 2016 Boston University College of Fine Arts Alumni Award. He wrote the words and drew the pictures in Strange Fruit, Volume I: Uncelebrated Narratives from Black History and Bass Reeves: Tales of the Talented Tenth, No. 1. Joel received his MFA from Boston University and a BA from Roanoke College. His secret lair is behind a secret panel in the kitchen of his house (sold separately) in New Boston, New Hampshire where he lives with his wife, four children, talking dog, and two psychic cats. Visit his website at joelchristiangill.wordpress.com or connect with him on Twitter (@jcg007). Gill believes that 28 days are not enough when it comes to Black History. Join the discussion on social media by following Joel's #28DaysAreNotEnough, his call-to-action about Black History.